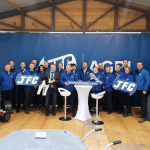 The Management of JFC Group wish to confirm that JFC Civils operations facility in Stratford-Upon-Avon, UK experienced a fire on 16th October 2018 which destroyed a warehouse and stock. The cause of the fire has not yet been identified. All employees and on-site personnel followed safety procedures and were safely evacuated from the site. The Manufacturing facility which produces CorriPipe™ and CorriDuct Twin-wall Pipe was not impacted therefore production will resume following a site investigation and official clearance. We wish to thank the various fire departments, the Fire Chief, emergency professionals and the local Environmental Agency for their dedication and support in managing and controlling this fire and to acknowledge the bravery and quick response of the JFC employees. We apologise to the neighbouring businesses, public, our suppliers and customers for any inconvenience caused and would like to assure our customers that orders will be processed via the JFC Group’s alternative production facility until the Stratford-Upon-Avon site is fully operational.